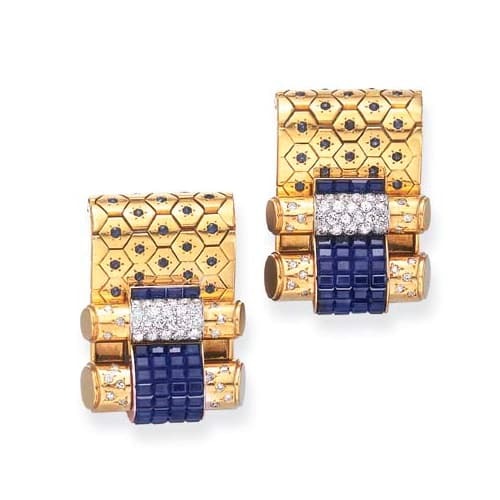 Although the term “Retro” wasn’t coined until the 1970s, the jewelry of the late 1930s and 1940s was definitely different from its antecedents. The end of the Art Deco geometric aesthetic came at the International Exhibition of Arts and Techniques in Modern Life – 1937, Paris. Assistant Commissioner General Paul Léon believed that the Exhibition would revive the jewelry arts and return jewelers to the use of ornamentation with grace and variety. A newly spawned uniqueness was noticed in the jewelers in 1937 as opposed to the similarity of their work at the 1925 Exhibition. Georges Fouquet, the Chairman of the Vetting Committee appropriated the rules as set up for the 1925 Exhibition but exhorted the committee ‘not to refuse or discourage any projects except for those clearly influenced by certain historical style or closely imitating nature’.1 In spite of this declaration, scrolls, volutes, flowers, and animals decorated with colored stones were overwhelmingly popular motifs with the jewelers throughout the Exhibition. Attention was drawn to the vast innovations in the jeweler’s art that allowed for extreme masterpieces of engineering and a superb lightness in the mountings. Van Cleef & Arpels invisible setting, perfected c.1935, was a main attraction, showing off the myriad of shapes required to completely fill all the spaces in a piece. The lattice that holds the stones, viewable only from the reverse, has to be meticulously made and each stone must be precisely cut to fit in its place. Convertible jewelry was another hallmark of the Retro period. Necklaces converted into bracelets or into a bracelet with matching earrings. Chaumet was famous for an epaulet that could be worn as a bandeau or separated into numerous clips. 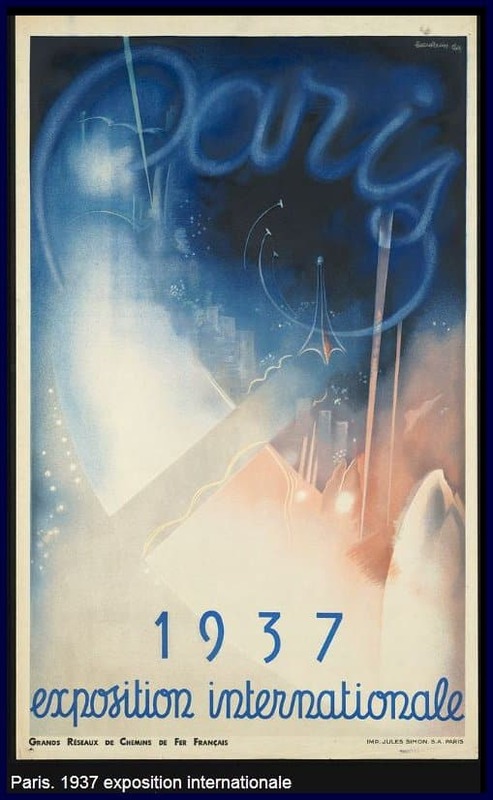 Poster for the International Exhibition of Arts and Techniques in Modern Life – 1937, Paris. The ever versatile clip brooch was still very much in vogue. Worn singly or in pairs, these clips were often designed to attach to a bracelet, necklace, hairclip or other device. This versatility ensured their popularity well into the 1950s. Van Cleef & Arpels created a necklace with a detachable central element that could be converted to a bracelet. Cartier engineered a necklace that split apart to create five clips that could be worn separately or joined and worn together. Retro Rose Gold Gas Pipe Necklace and Bracelet. c.1940s. 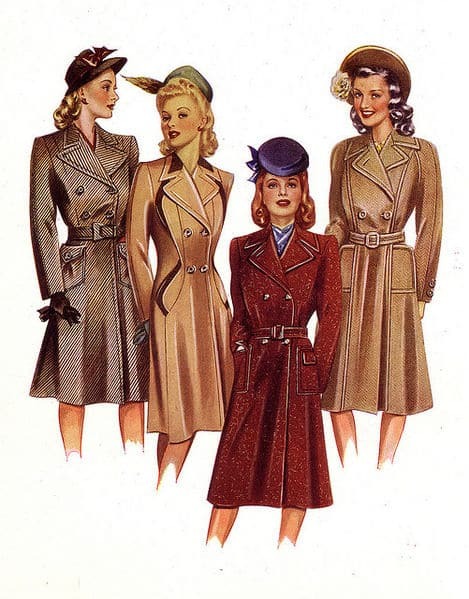 Women’s Fashions Took a Masculine Turn During the War Years. Women’s Fashions Took a Masculine Turn During the War Years. At the start of the 1940s, the jewelry arts were interrupted by the onset of World War II. Precious metals, especially platinum, were rare and in some instances forbidden to be sold. Palladium was substituted for the platinum being used in the war effort. In order to eek the most out of the available gold, a low karat gold alloy was used with a higher copper percentage. This resulted in gold with a subtle but distinctive reddish tinge and indeed through the cunning use of alloys, gold appeared in multiple colors within a single piece. 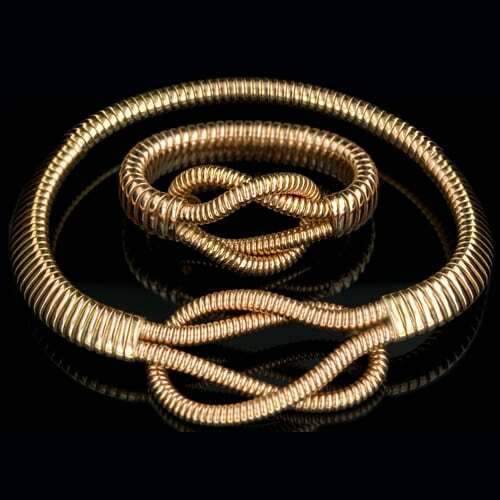 Gold was manipulated in various ways; woven, braided and coiled. 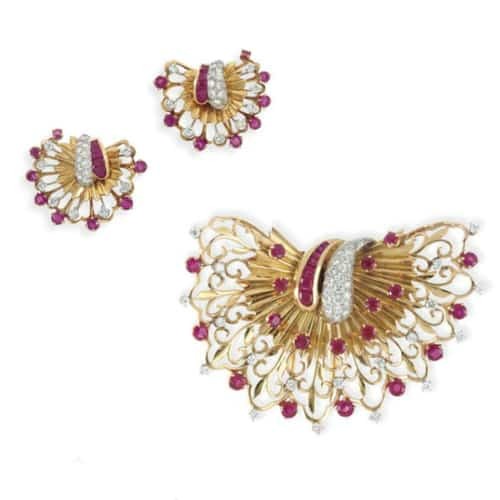 Resilla, cannetille and lacy filigree patterns reappeared in jewelry. Various textures were juxtaposed within a design putting matte finish next to bright to accentuate the design. 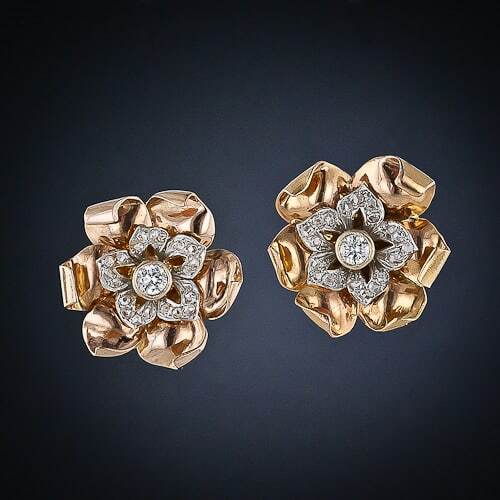 Gold became the quintessential jewelry metal of the 1940s and 50s. Incredibly light but with a heavy appearance, snake chain or gas pipe (sometimes referred to as tubogas) was first seen in 1934 and was in evidence throughout the 1940s. Innovative jewelers used gas pipe/snake chain in necklaces, bracelets, and belts with various clips and decorative motifs attached. Another innovation by Van Cleef & Arpels was the “Ludo” bracelet. This was a strap bracelet composed of brick-like rectangular or octagonal plaques, often set with gems, highlighting a large ornamental clasp emblazoned with gems. Pre-war metal and gemstone stocks were used sparingly and clients often had to be content with remodeling their existing jewelry. If you wanted to have a special new jewelry item made, you had to supply your own precious metals and, in the case of France, a percentage of that precious metal would be confiscated by the State for the war effort. Techniques to create thinner sheets of gold, sometimes backed by base metal, were devised so that the scale of these remarkable jewels was not diminished. A market for estate jewelry thrived as consumer confidence leaned toward precious metals and gems and away from currency. War could not dampen our desire to adorn ourselves with jewelry and in fact, the austere and often masculine fashions of the 1940s needed a touch of bejeweled feminism, if not outright patriotism. The flow of gemstones from South Africa, India, Burma and other countries was intermittent at best and almost nonexistent to some countries. The result was often the substitution of synthetic and faux gemstones in new jewelry designs. Gemstones such as citrine, amethyst, aquamarine, and topaz provided a range of hues and larger sizes. Diamonds, rubies, and sapphires of any significant carat weight were scarce. Jewelers used these precious but petite gems in pavé and invisible setting to create a massive look from a quantity of smaller stones. Gemstones were blended to create graduated color changes when spread across a brooch or bracelet. 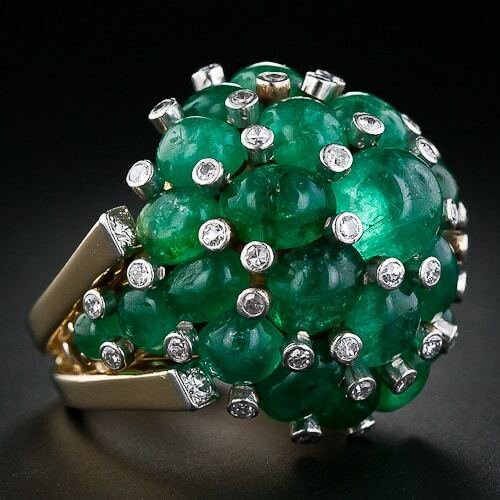 Pre-World War II jewelry designs usually paired colored stones with diamonds. Once the onset of war compromised the gemstone supply lines, colored stone combinations without diamonds became the norm. Rubies and sapphires were seen paired with moonstones, aquamarines and other larger, paler gems. Enamels were also used to accentuate the vivid gems (or even replace them) in a painterly fashion to bring inventive highlights to the underlying gold. Boucheron created a series of floral necklaces enhanced by the masterful use of transparent enamel. 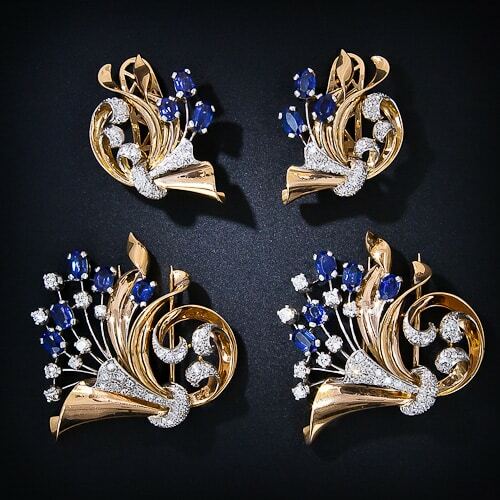 Pair of Retro Van Cleef & Arpels Invisibly-Set Sapphire and Diamond Clip Brooches. c.1935. Photo Courtesy of Christie’s. Cartier Protested the German Occupation During World War II by Creating Small Pins Depicting Caged Birds. c.1942. What better way to display your patriotism than wearing it. VCA’s “Hawaii Collection” of small blue, white and red flowers blossomed on brooches, rings, earrings, bracelets, and necklaces. Their good luck “Swallow” brooches were also often decorated by tricolor flowers. Cartier created their infamous “Bird in a Cage” in 1942. Its display in their Rue de la Paix shop window was a source of constant annoyance to the occupying German Forces. 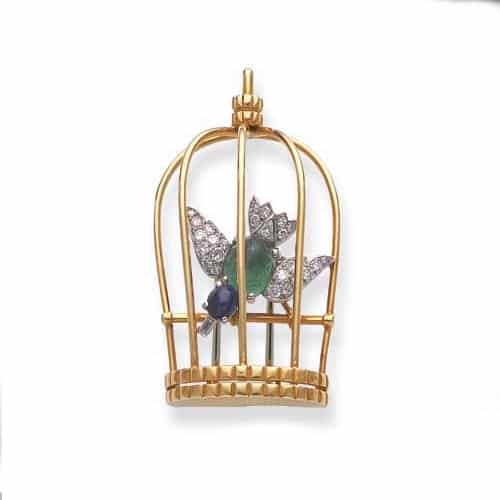 In celebration of the Liberation, Cartier famously countered with a “Bird at the Door of its Cage.” Between 1941 and 1947 Boucheron’s contribution consisted of figural brooches in regional costumes and miniature French landscapes. 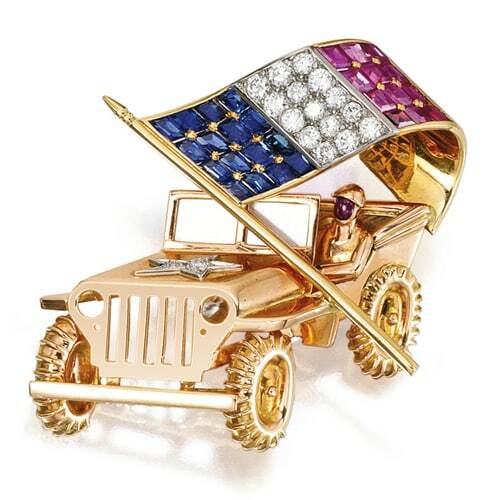 Mellerio created soldier brooches, weapons, armored cars and the like while Mauboussin specialized in airplanes and later a Liberation “Jeep” brooch. Jeep de la Libération c.1945 by Mauboussin. 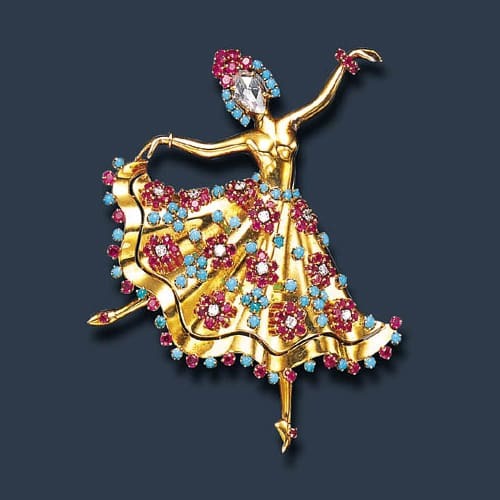 Van Cleef-&-Arpels Ballerina Brooch c.1944. The “Ballerina” clip, realistically rendered and pavéd in gemstones, was created by Van Cleef & Arpels and imitated by everyone. The ballet dancers were soon joined by gypsies and other graceful figures in colorful gem-set costumes. This eventually evolved into the “Whirlwind” motif. Gold continued to be used in various ways to imitate fabric textures. Braided gold was also used to create fringe, tassels, knots and woven motifs. Bows, feathers and volutes made a resurgence in silky smooth ribbon-like gold sometimes covered in gems. 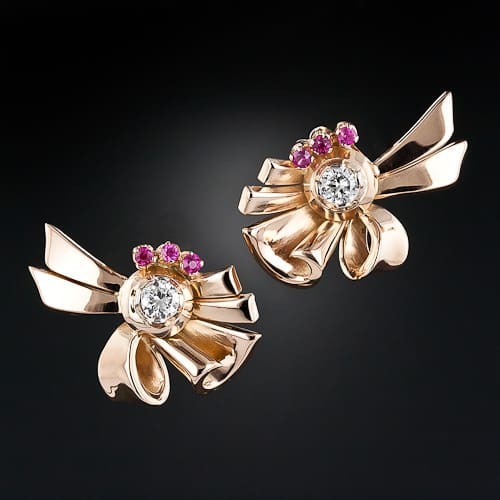 A veritable garden of flowers sprouted throughout the designs from the major jewelry houses. Virtually covered in gems or created from various colors of gold to provide contrast, flora and fauna were dominant themes of the period. Not to be left out, fruits and vegetables were well represented in Boucheron’s cabbages, olives, hazelnuts and corn motifs. Ballerina Brooch and Matching Earrings. Cartier Duchess of Windsor Panther Brooch c.1949. Photo Courtesy of Cartier Collection. Birds were a specialty of many fine jewelers of the period. Incredible, realistic birds were created by Mauboussin, Van Cleef & Arpels, Cartier, Mellerio, and Sterlé. The exaggerated plumage of these avian subjects was splendidly rendered in rainbows of gemstones, full palates of enamels or, as perfected by Sterlé, with a masterful use of plaited gold filigree. Mellerio’s “Hummingbird” is a well-known example, designed in gold and enamel. Van Cleef & Arpels created a line of small gemstone birds perched on branches, in nests or resting on hats. They also created “The Love Birds” ring, in gold with diamonds and rubies, designed so the bird’s wings and tails encircle the finger. Following the passion for birds, feathers also became a popular subject for jewelry. Lions and tigers and panthers? Oh, my! Bejeweled jungle cats seemed to spring up everywhere. 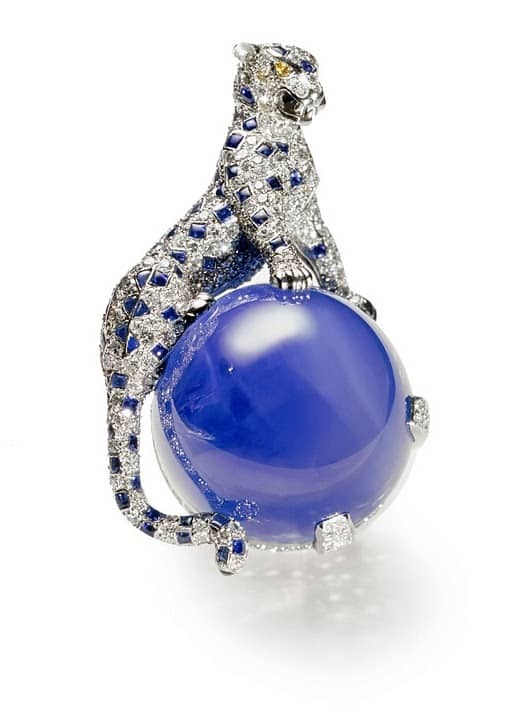 Cartier’s iconic panther took several forms including one, acquired by the Duke and Duchess of Windsor, perched on a 152.35 carat sapphire sphere, one of many the Duchess would own. 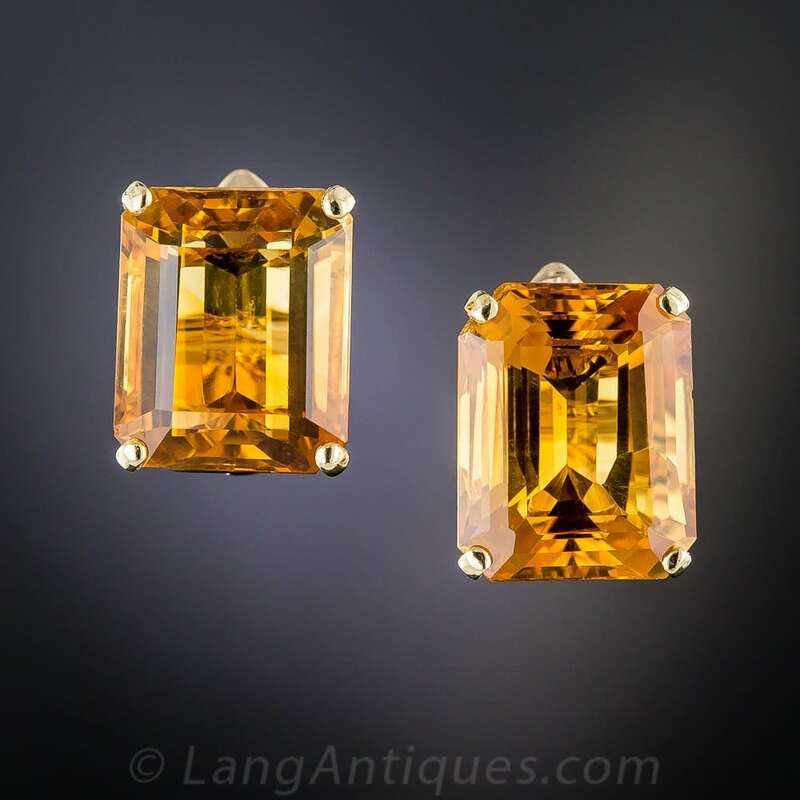 Heiress Barbara Hutton had a passion for tigers and owned a brooch crafted with yellow diamond fur along with tiger motif earrings, bracelets, and a clutch. René Boivin was renowned for a bejeweled tiger-skin design bracelet. Domestic dogs and cats, horses and bees, and other beasts rounded out the passion for animal jewelry. Along with the floral and animal motifs that flourished so dramatically during the 1940s, a new dimension proliferated – movement. Flexible branches, trembling petals, vibrating butterfly wings all brought new realism to these already lifelike creations. Tiny moving threads terminating in gemstones were mounted on rings and in ball forms so that the trembling movement would send scintillating flashes toward the admirer. 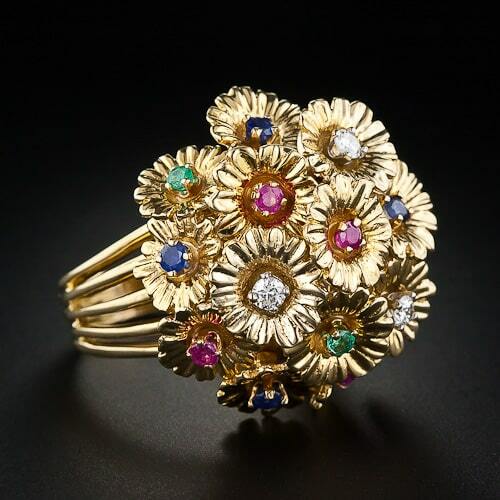 Floral Multi-Stone Boule Ring with En Tremblant Flowerheads. c.1950. Chain link charm bracelets adorned the wrists of women from high society to the PTA. The variety of dangling charms ran the gamut from tourist attractions, animals and martini glasses to the kitchen sink. Virtually everything was represented as a charm that could be collected and added to the bulging bracelets that were so beloved. Post war austerity gave way to new more lively colorful and flirty feminine fashions. Jewelry adopted a return to naturalism. Large three-dimensional flowers, birds, animals, snowflakes and other natural themes were seen along with bows, ribbons, and scrolls. 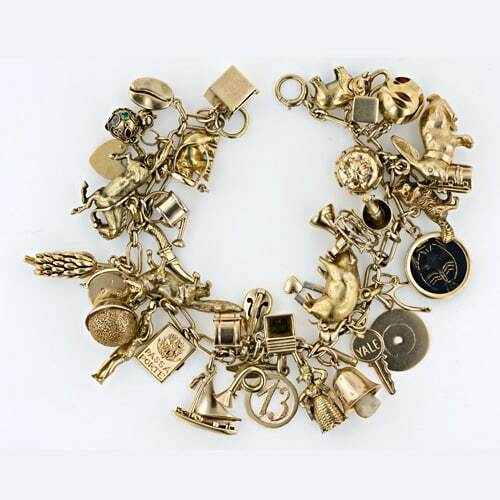 40 Miniature Charms Depicting – a Kettle Drum, a Spinning Fan, a Menagerie of Animals, and More. Gold had firmly replaced platinum as the jewelry material of choice. No longer limited to yellow and white, multiple shades of gold were employed, often in a single piece, accenting and punctuating the design. A proliferation of gemstones of every color and of precious and semi-precious status, were combined in multi-hued designs as we moved forward toward the fabulous fifties. Big and bold were the watchwords of ring design. 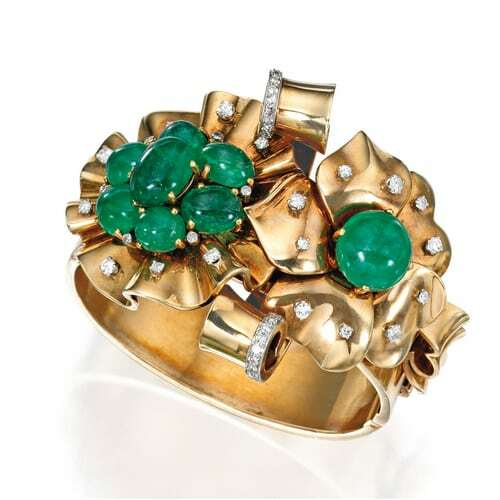 Bombé or boule rings pavéd with colored gemstones competed with flowerheads and enormous citrines and aquamarines for the most popular ring style. Mimicking brooches and earrings, scrolls, volutes, fans, and ribbons also made an appearance on the fashionable finger. Brightly colored gemstones were pavéd, star-set or invisibly set on every possible surface. Retro 22ct. 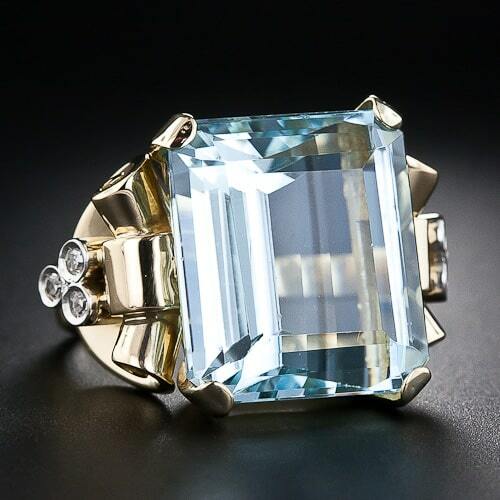 Aquamarine Ring with Scroll Motif Mount. Retro 70ct. 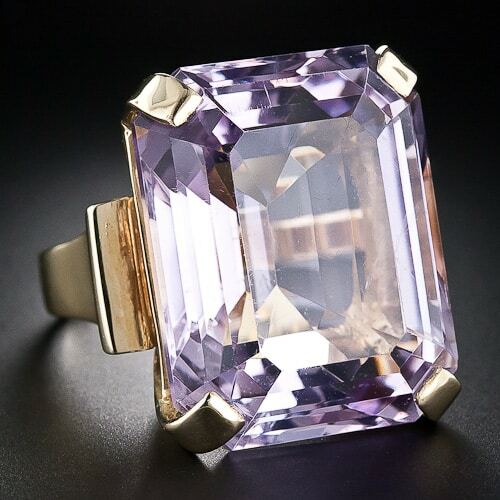 Kunzite Ring with Bold Gold Mount. 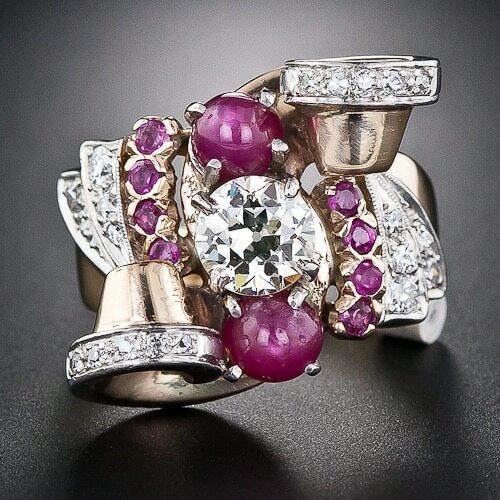 Retro Ruby and Diamond Ring with Scroll and Fan Motif Accents. Large earclips echoed the motifs of the day. Multicolored fans, volutes, scrolls, flowers, ribbons and bows pavéd with diamonds and accented by rubies, sapphires, and emeralds were clipped to nearly every feminine lobe. Large individual step-cut gemstones were also mounted as ear clips, sometimes decorated with a gold ribbon or scroll. 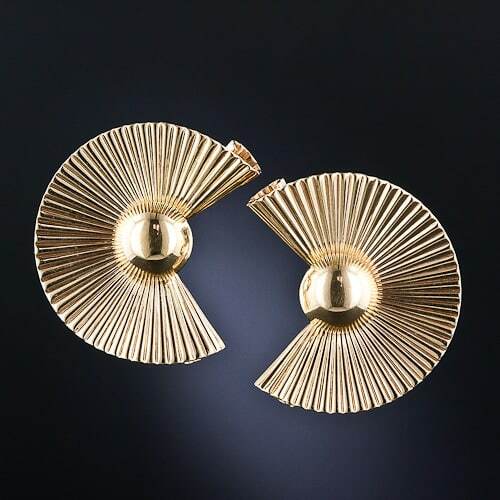 Tiffany & Co. Retro Yellow Gold Fluted “Fan” Earclips. Ruby & Diamond Retro Ribbon Earclips. Fabric motifs such as pleated lace, flowing ribbons, outsized bows, and knots, were rendered in multicolored gold and set with large aquamarines, citrines and amethysts to be fashioned into clips and brooches. Animals, birds, fish, flora and fauna were all realistically and playfully rendered on a large scale with whimsical flowing feathers, fur, tentacles, fins, leaves, and petals. Articulated stamens and petals brought life to flowers, and calibré colored stones provided painterly accents to an incredible menagerie. 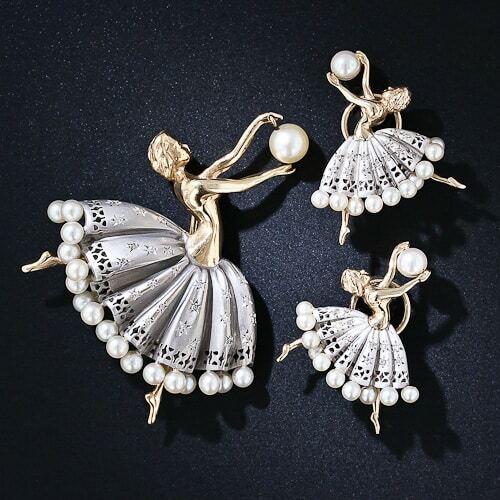 The extremely popular ballerina brooches by Van Cleef & Arpels had many imitators and remained in vogue for through the 1950s. 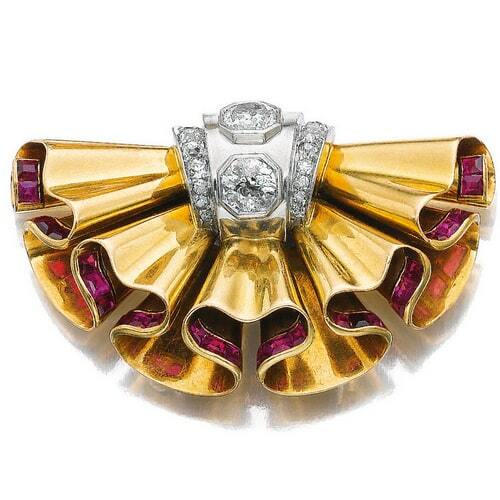 Retro Boivin Ruffled Diamond and Ruby Accented Brooch. 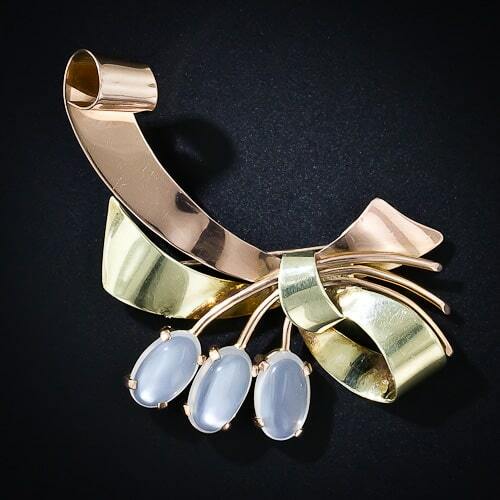 Retro Moonstone Bi-Color Gold Combination Brooch and Pendant. 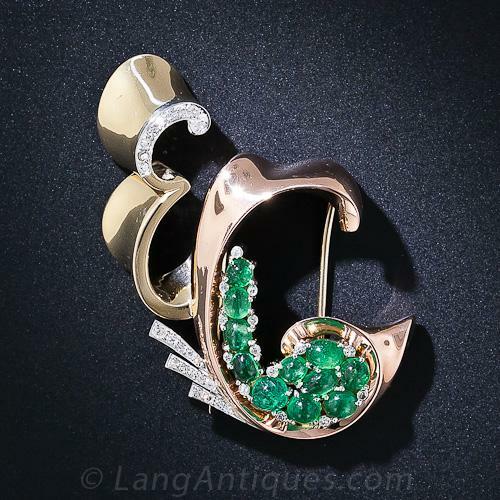 Retro Trabert & Hoeffer Mauboussin “Reflections” Brooch. 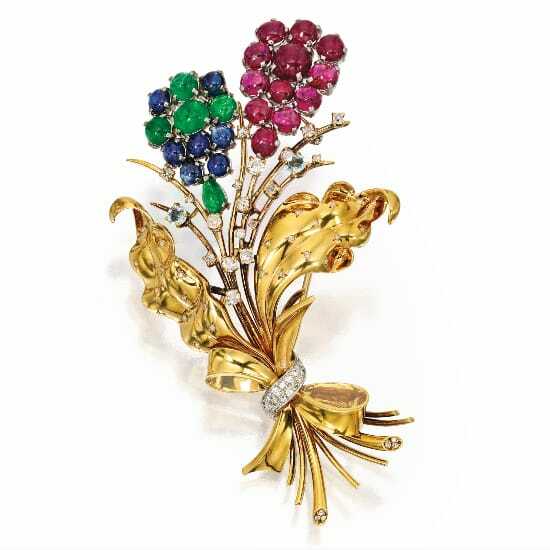 Retro Van Cleef & Arpels Multi-Stone Flower Brooch. The Ludo or honeycomb bracelet from the 1930s was more desirable than ever. Bicycle chain, gas-pipe, and scrolls created chunky gold bracelets with incredible dimension. The bigger the better was the theme of the day. Wide cuffs, a jarretière Victorian revival and woven and braided wide straps with oversized buckles or detachable clip brooches dabbed with gemstones flashed boldly on wrists. Recycled stickpins and charms of bygone eras dotted bold cuffs and bangles creating a unique decorative element. On a more functional note, a fashion for bold bracelets concealing diminutive watch works doubled as both bracelet and wristwatch. 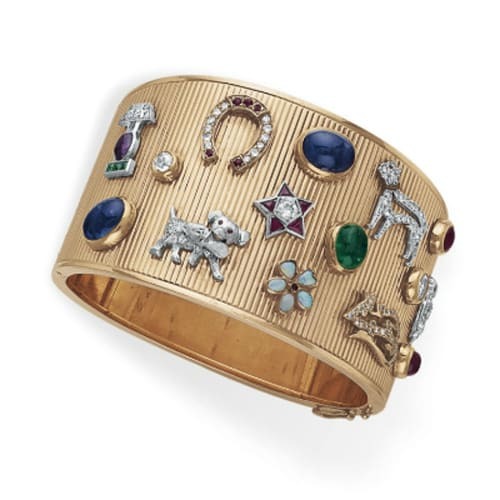 Van Cleef & Arpels Sapphire Ludo Bracelet. 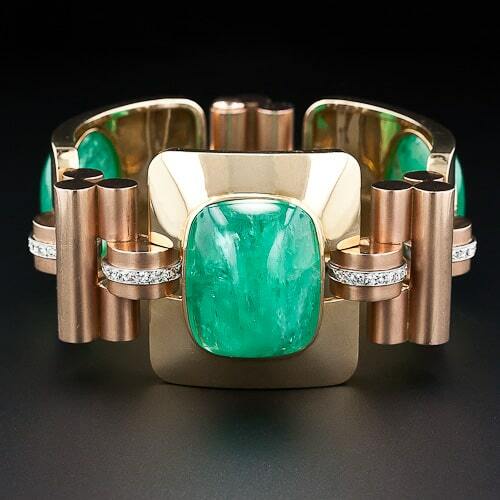 Retro Cabochon Emerald Gold Bracelet. 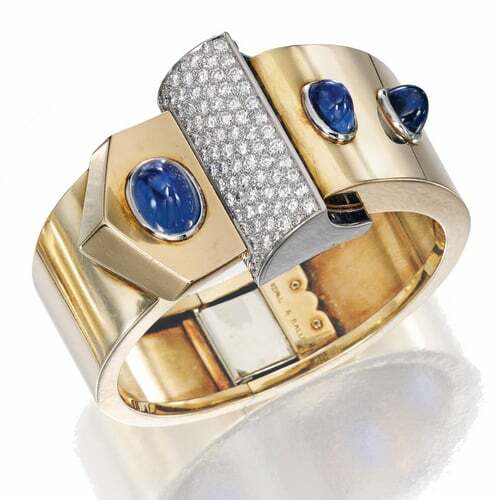 Retro Udall & Ballou Cuff Bracelet with Cabochon and Calibré-cut Sapphires. Retro Cuff Bracelet Enhanced by Applied Charms and Stickpins c.1945. Large fancy gold links and gas-pipe style chains were worn at the base of the neck. A detachable clip or convertible element was often used so that the necklace could be re-styled into a brooch and earrings or a bracelet, on a whim. There were larger bib necklaces created from a myriad of colored gemstones, gold links, twisted wire motifs and flowing linked mosaic-like gold or enameled plaques. Retro Gaspipe Necklace With Ruby Accented Flowers. One Flower is Removable to Go From Necklace to Choker. 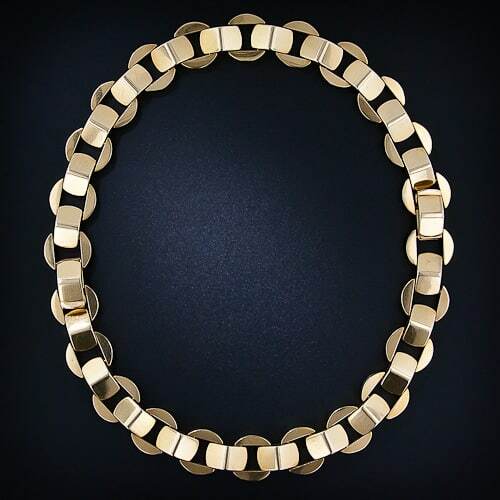 Retro Gold Architectural Link Necklace. Converts to a Pair of Bracelets. 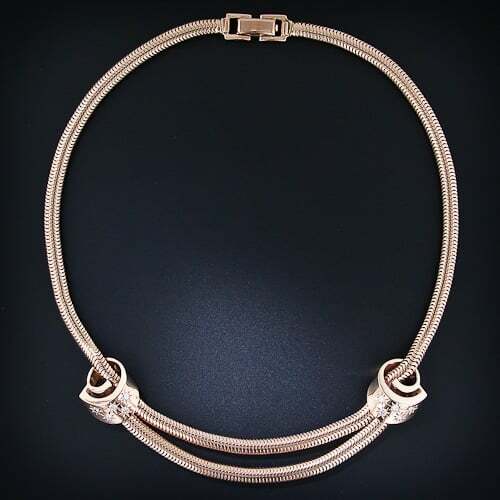 Snake Link Retro Gold with Diamond Scroll Accents Necklace. 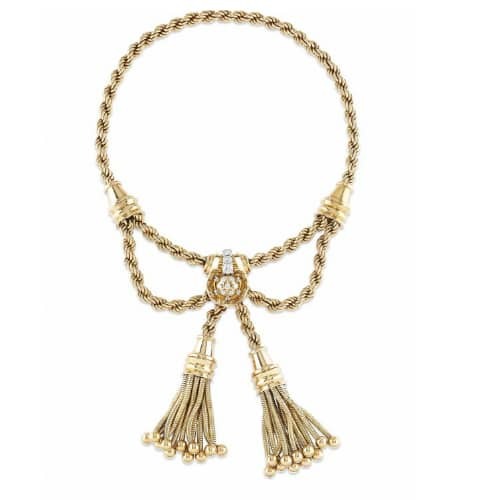 Signed and Numbered Boucheron, Paris Gold Tassel Necklace c.1946. These were not the enormous collection of matched jewelry pieces of the past but rather a sort of demi-parure or complementary suite. A matching necklace, earrings, brooch, and bracelet, or any combination of two or more of these elements, was fashionable. These suites were not always an exact match but a more thematic collection of flowers or fans or scrolls. Retro Synthetic Sapphire and Diamond Clip Brooch and Earclip Parure. 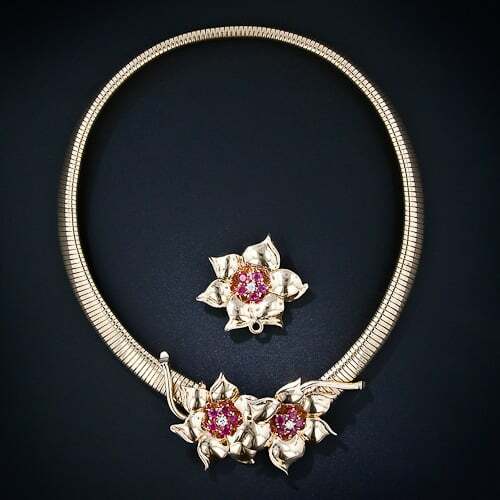 Retro Diamond and Ruby Fan Motif Demi-Parure. c.1940. 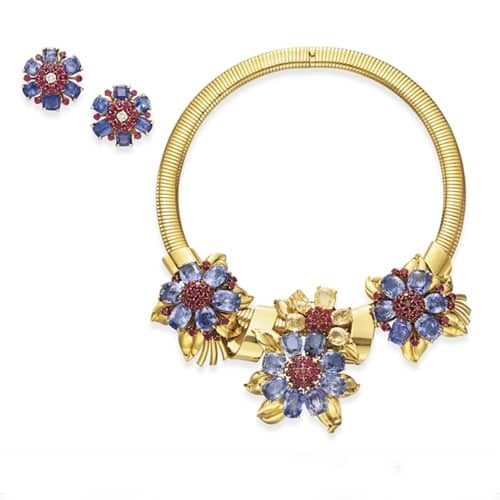 Van Cleef & Arpels Retro Colored Sapphire and Ruby Necklace and Earclip Demi-Parure. Flowers Detach to Form Brooches or Enhance a Bracelet. Earclips can be Joined to Necklace. 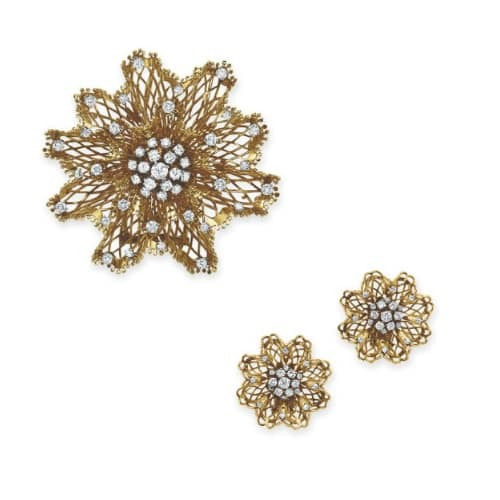 Van Cleef & Arpels Openwork Diamond-Set Floral Motif Earrclips and Brooch Motif Demi-Parure. c.1945. 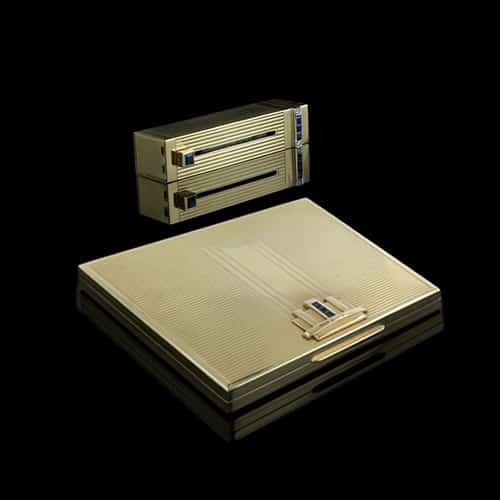 Compacts, cigarette cases, lipstick holders, lighters, minaudières were all part of life in the 1940s. The precious metals shortage resulted in the creative inclusion of other non-precious metal alloys to complete these functional yet beautiful accoutrement. Engraved, pierced, gem encrusted, woven and enameled, accessoires from the Retro era were some of the most innovative gem and precious metal items ever produced. 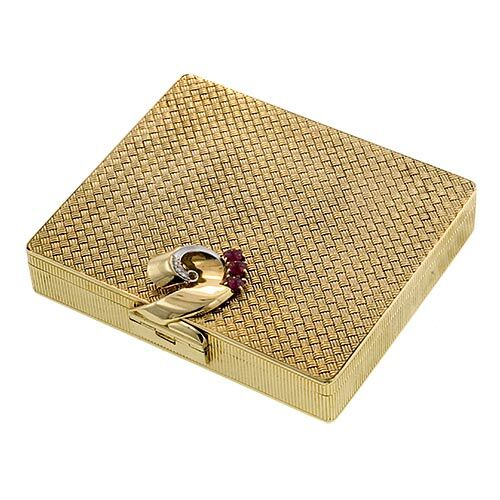 Retro Ruby Woven Cigarette Case. Tiffany & Co. Retro Sapphire Compact and Lipstick. 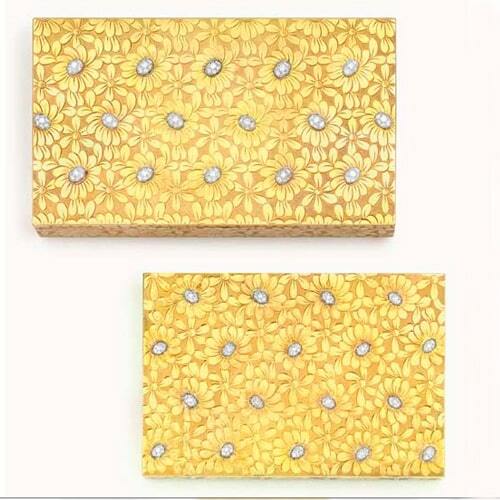 Van Cleef & Arpels Retro Marguerites Minaudière and Matching Cigarette Case. c.1950. 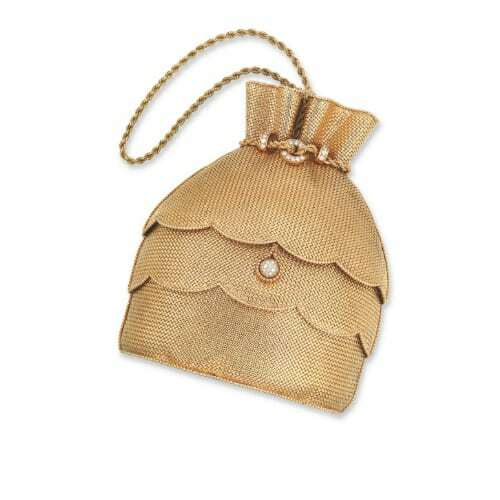 Van Cleef & Arpels Retro Woven Gold Evening Bag. c.1945. Coffin Sarah D. Set in Style: The Jewelry of Van Cleef & Arpels: New York Smithsonian, Cooper Hewitt, 2011. Raulet, Sylvie. Jewelry of the 1940s and 1950s. London: Thames and Hudson Ltd., 1988.